Let’s face it: life is not an easy experience for anyone. It’s prone to its ups and downs, those fleeting moments of absolute bliss followed by periods of despair – sometimes right beside each other, no less – and even the most well off of folks aren’t immune to the stress that it brings to us. 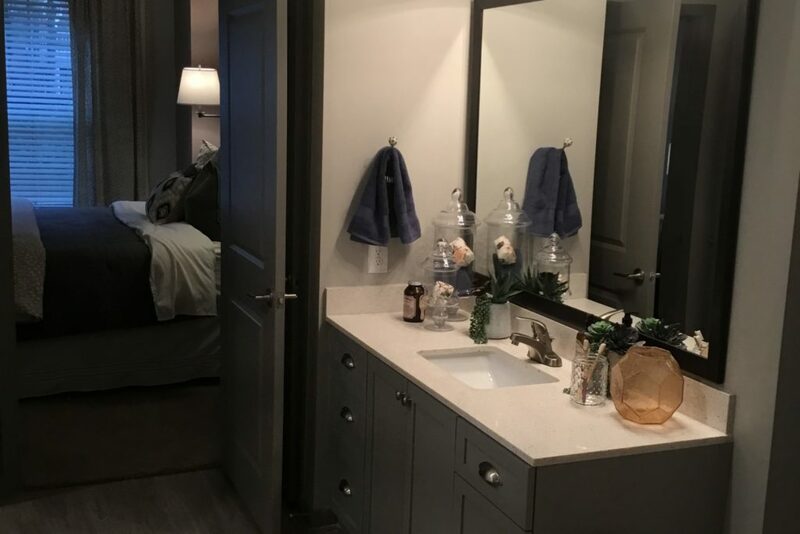 Here at Alexan North Station, our beautiful luxury apartments in Sandy Springs help take some of the burdens off your shoulders, with amazing amenities to soothe away your worries and to enjoy those happy moments much longer. For starters, all our luxury apartments come with the best technology to bring ease of mind; our keyless entry system saves you the hassle of juggling or possibly losing your keys, letting you into your home with a few quick button clicks, while the USB ports installed throughout each unit lets you charge your favorite handheld devices right from the socket rather than digging through a mess of cords and converters. Our spa-inspired bathrooms are the perfect escape from the mundane, with elements such as huge garden tubs perfect for hot baths and tiled stand-in showers for added luxury to your bathing routine. Stay cool in the arid summers or warm in the chilly winters thanks to our decorative 2” faux wood blinds, ceiling fans installed in the bedrooms, and efficient central heating and air conditioning. Finally, give yourself some peace of mind and a breath of fresh air right from the spacious private balcony or patio. Savor all the best moments from home here at Alexan North Station. Schedule a tour through our luxury apartments in Sandy Springs and check out our incredible amenities today.